Jungle Spirit Call of the Wild is an amazing new game by one of the biggest developers in the industry, Net Entertainment. The game has a very lucrative format that hosts up to 1024 ways to win during some spins. The game invites players to enjoy a one of a kind gaming experience that takes them to the wild. They will get to meet its animals and join them as they look for the treasures and the fortunes that are hidden in the jungle. The best part about all of this is that the game is available right here. Players can get to try out the slot and take it for a test drive prior to placing real moneys bets. 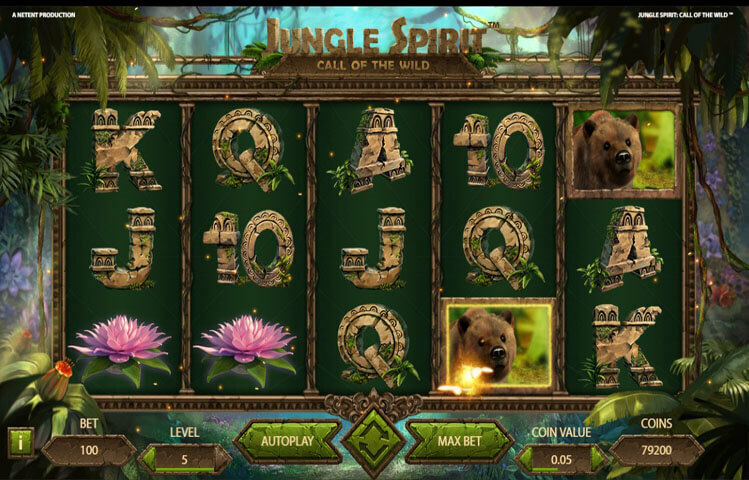 Jungle Spirit Call of the Wild by Net Entertainment has a five reeled setup. This 5 reel setup hosts 243 ways to win, and during special features, players will have up to 1024 ways to win. This guarantees players a highly rewarding ride that has multiple winning chances. In addition to the ways to win, the game also comes packing plenty of special features and bonuses for players to take advantage of during the game play. Players can view all of different payouts that they can claim, as well as the bonus features at the paytable of the game. Jungle Spirit Call of the Wild takes players on a great experience that takes place in the jungle. Players will join its animals, as they venture off into the jungle to find its hidden treasures and fortunes. Players will place their wanted bets underneath the reels of the game. They will go through the different betting options to do that. They can place a bet that varies between 0.20 and 100 credits for each spin. Players will then click on the spin button or the Autoplay button to initiate the game. Since the game is developed by Net Entertainment, players can expect an engaging and an immersive ride. The game’s reels are located in the jungle, and across the reels of the game, players will see the animals that they are going to join. This includes a bear, a snake, a crocodile, a tiger and an elephant. There us also the traditional low paying card icons. Jungle Spirit Call of the Wild has a lot of special features that players can take advantage of. There is the Expanding Symbols Feature. This is triggered as icons that come marked with a butterfly appear as a part of a winning combo. These symbols will expand to cover the entire reel. There is also the free spins round that is activated by 3 to 5 scatter icons. Lastly, there is the butterfly Boost feature that can be triggered at random during the game play.